Social Networking for Business Collaboration? What kinds of rights should we have when dealing with systems that gather our data? Does this mean we should not accept agreements that do no make this clear? Thoughtful piece in ReadWriteWeb It would be useful to have data access rights stated in in terms of these categories. Simply put, give us access to our data, enable us to use it for our own purposes, and give us ultimate control of that data. There is a long path to having all of that consistently. It is also more than just rights for data portability. The method uses text messages to transfer payments. The article goes on to provide a good overview of the current market, tests underway, and the belief by many that NFC will emerge as the standard for contactless payment via cellphones.
" With the acquisition of Fig Card PayPal is laying down a marker that the pioneer in disruptive payment won’t be left behind in the coming e-wallet revolution. The still arguably pre-nascent business is attracting new big tech players, like Apple and Google, while the traditional credit card players move towards creating systems that would make your smartphone your credit card ... "
MJ Perry on a global trend of a decline in manufacturing. Though with population increasing don't we still need to have more things to be manufactured? Very interesting statistics. In Roughtype: A look at a study that generates a measure called NFC, or 'need for cognition', which is ' ... "a recognized indicator for deep or shallow thinking." People who like to challenge their minds have high NFC, while those who avoid deep thinking have low NFC. Whereas, according to the authors, "high NFC individuals possess an intrinsic motivation to think, having a natural motivation to seek knowledge," those with low NFC don't like to grapple with complexity and tend to content themselves with superficial assessments ... '. The study looks at how users of social networking are classified with this measure. The measure itself was new to me. Business intelligence professionals are needed and companies and schools are seeking to provide the analytics training. Includes a video. In ReadwriteWeb: Some thoughts about the value of using AR in the workplace. I agree, there is more opportunity there, since at least currently, there tends to be more standardization in a work environment, and more leverage in making it more efficient. Good thought provoking piece. The library shelf stocking example is a good one I have mentioned before and can see it reapplied. FlowingData previews the book: Visualize This. " ... The FlowingData Guide to Design, Visualization, and Statistics A book by Nathan Yau who writes for FlowingData, Visualize This is a practical guide on visualization and how to approach real-world data. The book is published by Wiley and is available for pre-order on Amazon and other major online booksellers. Available July 2011 ... "
In the HBR Blog: How to Build Confidence. " ... Very few people succeed in business without a degree of confidence. Yet everyone, from young people in their first real jobs to seasoned leaders in the upper ranks of organizations, have moments — or days, months, or even years — when they are unsure of their ability to tackle challenges. No one is immune to these bouts of insecurity at work, but they don't have to hold you back.... " . Confidence is important, and you also have to know what you are doing. Good piece. Getting all the proper pieces together, making it easy to do, and then being able to interact with multiple sources, kinds and aggregations of data can be a game changer. Lauren Carlson contacted me a few days ago to point out some posts in her Software Advice blog. She originally posted a very good introductory note about the idea of Gamification for sales force automation. In particular looking at the aspects of using badge type rewards. Not an area where we had tried to use the idea. I have mentioned we had used the general gamify idea for solving tough problems which could use human interaction to generate alternative innovative solutions. Most were adopted later by altering them using design considerations. Then Vincent Beerman, followed with some more useful ideas about the concept, he is the Director of Development for SpectrumDNA, a Social Loyalty and Gamification Agency. Spectrum designs and builds Social Loyalty Programs (SLPs) that drive profitable transactions by fusing classic loyalty mechanics with game dynamics into apps that ignite the social graph. This work was new to me.
" ... By applying game dynamics to SFA (sales force automation) initiatives, managers can highlight the intrinsic rewards of helping others on the team through social indicators while providing the right extrinsic rewards for more mundane tasks. The rank and recognition game mechanic has driven the success of eBay, iTunes and Stack Overflow. ... Gamification does not mean ‘to make a game.’ The art of gamification leverages the science of human motivation to highlight intrinsic motivators and supplement measurable action with extrinsic rewards and recognition in order to optimize experience and productivity. ... "
Read the whole thing, very good, a manifesto for those seeking to sell management on Gamification. Not always easy. I am struck to how much gamification can take up some of the aspects of industrial simulation and predictive analytics. Its all about applying abductive methods to test out new, innovative methods that exist, un harvested, in the minds of all our employees. Extracting them can be made to be fun. Am continuing an exploration of the topic of gamification, more will be posted here in the coming week. Want to collaborate in further evolving the use of gamiication in the enterprise? Join in the comments if you like. Just exploring Flypaper: " .... Software anyone can use to create professional quality multi-touch, interactive or motion graphics content in one-sixth the time and expense ... ". Looks to be very good and easy to use so far. More experience notes to follow. See also their blog. Roger Dooley posts: Walmart CEO confirms Payday Timing Effect. Was thought to be common knowledge, but had never seen a specific 'proof' of the effect. Though this is a simple case, is an example of how an analytically armed retailer can track many aspects of consumer behavior. Recently I had a meeting with EmPower, custom market and media intelligence services company. Here is an overview of their background and services. We already live in a world where there is ubiquitous computing. Yet there are many complex challenges to combine, direct and have ubiquitous computing ideas link with a broad range of sensors, environments, people and other computing devices. More here with a free download. The aim of this book is to give a treatment of the actively developed domain of Ubiquitous computing. Originally proposed by Mark D. Weiser, the concept of Ubiquitous computing enables a real-time global sensing, context-aware informational retrieval, multi-modal interaction with the user and enhanced visualization capabilities. In effect, Ubiquitous computing environments give extremely new and futuristic abilities to look at and interact with our habitat at any time and from anywhere. In that domain, researchers are confronted with many foundational, technological and engineering issues which were not known before. Detailed cross-disciplinary coverage of these issues is really needed today for further progress and widening of application range. This book collects twelve original works of researchers from eleven countries, which are clustered into four sections: Foundations, Security and Privacy, Integration and Middleware, Practical Applications. Brett Bonner, Director, Research & Development, Kroger Co.
Paris Gogos, Director, The Nielsen Co. Reminder: The event is free, but you MUST preregister to attend. Please RSVP to tricia.burger@uc.edu to preregister. There continues to be significant challenges and opportunities in managing today’s retail supply chains. This year’s workshop will focus on the interactions between the retailer and upstream members of the supply chain. Retailers are drowning in data but are having a difficult time developing actionable insights. Join us to hear experts discuss the importance of information and analytics in improving retail performance: forecast accuracy, inventory turns (while reducing out of stocks), assortment planning and pricing optimization. Industry leaders from P&G, Kroger and OfficeMax as well as information providers, such as The Nielsen Co., Market6 and Retail Solutions Inc., will join faculty experts from the University of Cincinnati and the Wharton School (Marshall Fisher, PhD) to discuss the new science of retailing. The event will be held May 6, 2011, 10AM - 3:30PM with a short reception to follow at the University of Cincinnati’s Carl H. Lindner Hall in Cincinnati, OH. Seats are limited and registration is required. There is no registration fee. Attendees who preregister as of April 29, 2011, will receive the 2010 book The New Science of Retailing: How Analytics are Transforming the Supply Chain and Improving Performance by Marshall Fisher and Ananth Raman. To register, please contact Tricia Burger, tricia.burger@uc.edu, (513) 556-7140. To learn more or for suggested lodging accommodations, please visit http://www.business.uc.edu/SupplyChain/events . In this presentation we discuss the history and future of the Internet. The early work on packet switching is traced and then a brief description of the critical events in the growth of the Internet is given. We then present a vision of where the Internet is heading with a focus on the edge where user participation, flexible applications and services, and innovation are appearing. New book that looks to be of interest. There seems to have been somewhat less interest in ethonographic research lately after a flurry of interest in the early 00s. Search algorithm designers have in recent years worked out ways for computers to identify experts in any particular area of knowledge. But for users who'd like those experts to actually answer their questions, identifying them is just the first step. 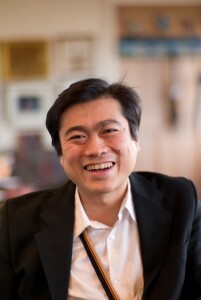 It's also helpful to figure out which experts they can get in touch with .... "
" Joichi Ito, tapped as only the fourth director of the MIT Media Lab, says having a bio that seems “scatter-brained” will make the 25-year-old institution, famous for its unorthodox research approach, seem just like home ... "
AT&T has started to sell what is being called a 'cell tower in a suitcase'. At a cost of between $15-45K, plus monthly fees. We examined something similar for campus usage a number of years ago in problematic areas. Coverage has improved vastly, but is still less than perfect, especially during group gatherings. I remain surprised by spotty downtown coverage. A good introduction to QR codes by Angie Schottmuller in Search Engine Watch. Pointers to basic considerations, vendors. mobile use and cases. Well done. Covered broadly in the last few days. The first consumer packaged goods company to try this. This is an example of a manufacturer going around retailers, also called 'dis intermediation'. Offers $40 of product for $20 and a $15 coupon book. Also, how will the privacy of data given to Groupon be ensured? This effort, initially in two cities, takes Groupon beyond their local roots. Also in the WSJ. Stan Dyck, colleague and correspondent, sends this along. The implications for modeling behavior are very great. Quoted from the WSJ below. Nathan Eagle was mentioned in MIT Tech Review.
' ... "We can quantify human movement on a scale that wasn't possible before," said Nathan Eagle, a research fellow at the Santa Fe Institute in New Mexico who works with 220 mobile-phone companies in 80 countries. "I don't think anyone has a handle on all the ramifications." His largest single research data set encompasses 500 million people in Latin America, Africa and Europe. I was corporate connection to the Santa Fe Institute for a number of years. What they did was always interesting, but often difficult to translate into useful things for the enterprise. I love the aspect of automatically building interactions. The first step in artificial intelligence. But caution is always important. Here is an example of building a pricing algorithm that can lead to an infinite loop, at least until the humans take control again. Ways to liven up twitter feed, with a number of business examples. Fairly good. Though still I think mostly playing to the weaknesses of Twitter itself. We visited Nokia's innovation group back in the 90s and were very impressed. They were the big disrupters then. Yet today they have been unable to credibly respond to the smart handphone market. HBS discusses this remarkable change and if we might see the same thing with other innovators. The Kindle edition of Steven Pressfield's excellent book: Do the Work is free. " ... Could you be getting in your way of producing great work? Have you started a project but never finished? Would you like to do work that matters, but don't know where to start? The answer is Do the Work, a manifesto by bestselling author Steven Pressfield, that will show you that it’s not about better ideas, it’s about actually doing the work. Do the Work is a weapon against Resistance – a tool that will help you take action and successfully ship projects out the door ... "
An example of bringing textbooks online to Android. This makes much sense. Instructional materials are further useful if they can be connected to other resources. But is it profitable for the publishers? In the WSJ, studies indicate we walk slower now. Implications for the modeling of retail spaces?
" ... Pedestrians need more time, too. For years, traffic lights here and nationwide were timed to the stride of the average pedestrian, who covered 4 feet of ground per second, according to federal research carried out in the 1950s. A couple of years ago, however, the Federal Highway Administration urged traffic engineers to recalibrate to an average stride of 3.5 feet per second, after new research showed that Americans' average walking pace had slowed over the decades. That would give elderly walkers more time to cross safely ... "
It has been rumored for some time, now the test is to proceed in California. A Ruby on Rails app highlights some serious, yet easily avoided, security vulnerabilities ... In May 2010, during a news cycle dominated by users' widespread disgust with Facebook privacy policies, a team of four students from New York University published a request for $10,000 in donations to build a privacy-aware Facebook alternative. The software, Diaspora, would allow users to host their own social networks and own their own data. The team promised to open-source all the code they wrote, guaranteeing the privacy and security of users' data by exposing the code to public scrutiny. With the help of front-page coverage from the New York Times, the team ended up raising more than $200,000. They anticipated launching the service to end users in October 2010 .... "
Scott Monty, the head of social media for Ford Motor Company, discusses the gamification of social media. Gamification of business processes is a favorite topic of mine, which we experimented with in the enterprise. Again I recommend Reeves's and Leighton's book: Total Engagement: How Games and Virtual Worlds Are Changing the Way People Work and Businesses Compete, for an introduction to the concept. An article and video showing an example of brain computer interfaces for communications and control. " .... Brain activity produces electrical signals detectable on the scalp, on the cortical surface, or within the brain. 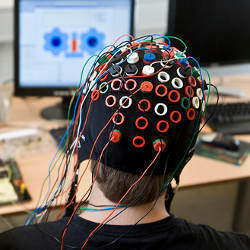 Brain-computer interfaces (BCIs) translate these signals into outputs that allow users to communicate without participation of peripheral nerves and muscles ... ". Good technical article and video with background on brain computer interfaces. A good and detailed case study of the use of Cinco de Mayo festival and a viral YouTube App to promote a consumer packaged goods video. Good example of how big companies are using social media for marketing, replacing some of the more typical media choices. Note the emphasis on engaging consumers, and the simple 'game' environment. Targeting the victims of the next big hangover-inducing holiday, Pepto Bismol has introduced a YouTube app for Cinco de Mayo. Visitors to Pepto Bismol’s YouTube channel can find a handful of options to make their own “Pinata Smash” video. There are four different pinatas to choose from, two snacks to fill them with and two “smashers.” When the video is completed, users can share it on Facebook or Twitter. Kristen Stutz, assistant brand manager for Procter & Gamble, says that there will eventually be 15 to 20 iterations of the video. “The idea was not just to provide content, but be able to enage [consumers] with it,” she says .... "
Some interesting links on ubiquitous sensors in Techdirt that attracted by attention. Some more useful than others, but worth exploring. It is about gathering data, analyzing it and using it to make useful predictions. We are getting more data and the opportunity is considerable. Is 'Social' Business Collaboration Just an Expensive Fad? To that end, these companies have begun piling social networking functionality on top of applications that initially were built for managing back-end business activities such as tracking the movement of goods across a supply chain. The vendors are selling this new functionality as a way of improving communication and collaboration across an enterprise ... "
A good post in the ACM blog about how opinion statistics are often done wrong. I have seen similar things done in the enterprise. Well worth understanding. The comments are also worth reading. Google has released its own Groupon offering. Having now used Groupon a number of times I can understand the attraction. Yet I still get the feeling Groupon is sloppily done, with relatively little matching to the needs of the vendor being server. How will Google provide better service to both the vendor and the consumer? Unilever has sold off its position in online research agency BrainJuicer, after an usually lengthy eight year investment. A quick look at BrainJuicer seems to make them be an agency using alternative methods like neuroscience, sociology and crowd sourcing. In particular see their predictive markets paper. A new browsing capability has been added to Google Earth called Cruising that lets you move through posted images. Nice idea, though it is most interesting where there are enough photos to cruise. Good examples in the Lat/Long link above. Mark Perry on booming technology jobs. Which should lead to more training, learning and transitional opportunities. This got lots of attention today, in the Washington Post and in The Guardian. A file full of unencrypted GPS coordinates in your IPhone or IPad, ready to be picked. Technical details discussed here. A field day for attorneys, a lawyer friend of mine suggests, Clear privacy violation, and I have to think that this will be corrected in the next version of the OS. Apparently Apple folks are not THAT smart. Update: GigaOm reports that police are already using the data. Update: More detail: Apple is not tracking your exact locations, not even the cell towers you used. So the information is not quite as private as was thought. An article in the HBR: " ... In a collaborative enterprise, individual capabilities become valuable only if they contribute to the success of the whole. The standard of performance shifts to the extent to which each person has contributed to the shared task or mission. The behavior of individuals operating successfully in an environment of extended collaboration requires active engagement, a willingness to challenge and to make "adult" choices.... "
A prototype robot, called FRIDA, which has some human characteristics, to staff the production line. The way I understand this, the humanoid form allows it to be used in lines already designed for humans, so it can be used in conjunction with them. " ... designed to be dexterous enough to replace a human being on a production line. It's a good thing that'll alleviate employee shortages, not subjugate the human race ... "
Roger Dooley presents a neuromarketing challenge. He asks for examples you can share where neuromarketing has been proved directly valuable to industry. I look forward to the results. We need more of this kind of challenge and categorized sample studies to direct us to useful methods. Join in. Excellent Article on Neuroscience Impact on Market Research Industry, via Ron Wright, CEO of Sands's Research. He writes: " ... Thought you might find this article article of interest. Millward-Brown (part of Kantar / WPP) works with our competitor, Emsense. Graham Page of M-B provides an synopsis on the present state of neuromarketing with its rapid growth and extensive influence of market research .... "
Ticketmaster had decided to start dynamically adjust the prices of tickets it sells, depending on demand. This in theory will address the ticket scalping seen by many as a problem with ticket services. It should also drive more of the profits to Ticketmaster. Interesting quantitative modeling problem. In MJ Perry's blog, with more discussion. In Mashable: About the use of tablets in commercial applications, such as on restaurant tables. There seems to be much interest. We experimented with similar set ups on grocery store carts for years. Some of the learning could well be transferred. Allowable content and capability often come up. Some shoppers we interviewed wanted to have full on-line laptop capability: e-mail, open browsing, etc. Most retailers were not keen on the distraction from the shelf. Different environment at dinner. Cost and security of the devices was often brought up.
" ... At Kosmix, we’ve been building a platform, called the Social Genome, to organize this data deluge by adding a layer of semantic understanding. Conversations in social media revolve around “social elements” such as people, places, topics, products, and events. For example, when I tweet “Loved Angelina Jolie in Salt,” the tweet connects me (a user) to Angelia Jolie (an actress) and SALT (a movie). By analyzing the huge volume of data produced every day on social media, the Social Genome builds rich profiles of users, topics, products, places, and events.... "
Worth reading the whole post and following. But will the blog survive the Wal-Mart acquisition? Wal-Mart makes an interesting move into social media with the acquisition of Kosmix. " ... According to sources close to the situation, Wal-Mart Stores paid just over $300 million for Kosmix. The six-year-old Mountain View, Calif.-based company–which has built a social media platform that organizes content by topic–has raised $55 million from a large group of Silicon Valley venture firms ... ". Worth following to see how this might link social media and retail in new ways. Have some ideas about where this might go. See also Wal-Mart's press release and the Kosmix CEO's blog. There he talks about the social genome and that " Retail + Social + Mobile = @WalmartLabs ". His post provides considerable additional detail about the motivation of this. We examined the use of the MS package mobile Photosynth for producing panoramas of multiple images. See the link for a stitched view of Seattle Japanese gardens. We were not interested in vacation pictures, but rather how to use them to create panoramas of store shelf layouts that could then be easily compared to plan-o-grams. Now the Photosynth package is available for the iPhone at least, and can be used to readily store images to Bing maps and share. A way to construct a virtual image of a 3D world. More in Fastcompany. A good post from SASCom Voices on SAS vs JMP. I used both in the enterprise, SAS from the very beginning in 1978. Considerably later JMP was brought it and got wide and enthusiastic usage within the P&G enterprise. It was obviously very well done and I still heartily recommend it, the user interface itself brought many I acted as a consultant in both packages, but it has been many years since. SAS was also used for the purposes of doing much more than statistical analytics, like arranging and cleansing and reporting on data. I no longer have easy access to either package. If SAS would like a correspondent on how an experienced enterprise consultant, now a traveling business analytics consultant might use it, send me a license. The 21st century is a world in constant change. In A New Culture of Learning, Douglas Thomas and John Seely Brown pursue an understanding of how the forces of change, and emerging waves of interest associated with these forces, inspire and invite us to imagine a future of learning that is as powerful as it is optimistic. Their understanding of what constitutes “a new culture of learning” is based on several basic assumptions about the world and how learning occurs ... "
" .. P&G's future is in the tangle of makeshift stalls at Oke-Aje market, 5,000 miles from the company's trademark twin towers in downtown Cincinnati ... Women in red and gold dresses haggle over prices for mackerel, cashews and Procter & Gamble diapers and laundry soap. Men just off jobs at auto shops trade a few naira for a single P&G-made razor or a handful of P&G-made throat drops.... "
The linked to article contains much more detail, pictures and a special report. A good general article on keeping company data safe on personal devices. It is becoming increasingly important. In conversation I had with a company security person I was amazed at the number of smartphones that are lost every month. In Chief Learning Officer, a blog that has been including some very useful content lately. " ... Virtual learning has pros and cons, but with proper design and a focus on relationship building, learning leaders can capitalize on benefits and minimize risks .... the benefits of virtual learning and collaboration — the ability to engage people in a rich learning environment and to stimulate additional conversations and experiences — far outweigh the risks, if virtual learning can be planned and designed effectively." A report that e-Book sales in the US are overtaking paper. Just started taking a look at Myshopanion. An IPhone App that has just been updated. They write: " ... we have mastered the latest mobile shoppingconcepts – barcode scanning, price comparisons, customizable product searches,and many more – but in addition to these, myShopanion brings a whole newe lement to the table... a shopping social network. It gives users the abilityto share information and comments about a product with friends in real time,providing valuable advice on the go and eliminating buyer’s regret.... ". Looks to be of interest. I will follow with more comments. Alison Bolen at SASCom writes about some examples they heard about how grocers are using data intense analytical methods. A good general overview of Google PageRank from the Search Engine Watch blog. From Inside Higher Ed: In recent weeks I have been asked by several people about the validity of using Wikipedia links for research, both inside a company and for an academic paper. I pointed out that there is still considerable animosity towards the WP from academia. So I cautioned that you should check with the specific professor before citing the WP. Inside the enterprise there is less animosity, but still quite a bit of caution at play. In either case it is good to be cautious. This article shows that there is perhaps some weakening in the negative views. Robots will change the way we work. They will have intelligence and awareness. They will be teachable, safe and affordable. They will make us productive in ways we never imagined. Robots will reinvigorate industry and inject new life into the economy. Making businesses more competitive. Keeping jobs from moving overseas. Demonstrating the power of American ingenuity. Robots will change how we think about manufacturing. And Heartland will change how we think about robots ... "
Small Biz Labs reports on a Google survey of how consumers use tablets. Not too surprising overall. They are replacing TV use. A conversation with Nassim Taleb on living with Black Swans. In KnowlegeAtWharton. And more about black swan theory. I have mentioned innovative mobile retail tech company Aislebuyer here before. Now they announce that they will add a capability that will use optical character recognition technology to scan a credit card from a picture taken with a Smartphone. More details are in GigaOm. This will work with other offerings from Aislebuyer, that allow you to check out items in the aisle, via barcode scanning. I have been asked by several groups to post for their blogs in technology and innovation areas. Mostly for free, with the argument that it gives me publicity. I have played with the idea, but it does not pay. Now a major news blog is being sued for the practice of having bloggers work for free. Volokh gives amusing legal opinion on the suit. Rather late to this, just now started to examine it. " ... [W]e’re opening the Public Data Explorer to your data. We’re making a new data format, the Dataset Publishing Language (DSPL), openly available, and providing an interface for anyone to upload their datasets. DSPL is an XML-based format designed from the ground up to support rich, interactive visualizations like those in the Public Data Explorer. The DSPL language and upload interface are available in Google Labs ... "
Good, straightforward article about optimizing your Linkedin article for recruiting. I have helped several people get started with Linkedin lately and this is a good place to start understanding how it works. I was recently introduced to Trivantis. And their e-learning delivery software Lectora.
" ... Lectora Inspire makes online course development fast and simple. Bundled with the leading flash content creation, screen capture, and recording software, Lectora’s powerful authoring tools empower you to quickly create dynamic video and Flash eLearning content ... "
Developed by a number of former colleagues of mine over the last decade. What I have seen so far looks very good. Will follow with some more information as I learn more. In GigaOm: Google's infrastructure czar talks about the advantages of the cloud for making Google run. Tom Holme, the design director of IDEO, talks about an open IDEO, from Intersections. We worked with IDEO a number of times in the enterprise innovation spaces. Plus some other design related talks. Via Stan Dyck. Amazon adds product Ad Services. Very good report on experimental field trials with digital signage in retail by Intel. Via their acquisition Cognovision. I like the fact that this is real observational data. This study uses Anonymous Video Analytics (AVA) to gather data about shopper interaction with the signage. See also that my correspondent and colleague John Curran of MCosm cooperated in producing the experiments. New, A Banking Analytics Blog. Though it is not my field, it is worth seeing analytics from a different decision perspective. "How are banking leaders using analytics to power innovation and growth? What new research, trends and regulations are influencing analytics in areas like fraud detection and risk management? Via the ACM: University College London maps the complexity of the brains connections. A new field called Connectomics. Which among other techniques uses MRI and 3D Electron Microscopy. In FastCompany: How to Build an Unforgettable, "Smashable" Brand Identity (Hint: It's Not the Logo). Very good overview by Martin Lindstrom on the concept of a Smashable brand. Have heard him talk about this concept a number of times and it is worth understanding. I was surprised that the concept of the smashable brand is an old one. And, as the title suggests, most people think it is about the Logo. It is much more, about every sensory aspect of the brand that leads to it being unforgettable. See also Martin Lindstrom's site. Seth Godin on How to Fail. Provocative thoughts. Always intriguing Recorded Future blog spins some ideas about the Internet as data. I have had the opportunity to commission and examine some very large scale econometric based simulation models that used the Internet in part as a source of data. Simulations, Statistical explorations, integration of human intelligence are all possible. Its an idea worth looking at. Yet using the Internet also requires the careful examination of the quality of data involved. That carefully done, there are some clear possibilities to be explored. Recorded Future itself is an example of how this can be done.
" ... the next compelling step is when we realize that the big breakthrough is not to put traditional BI software in the cloud but to realize that the most compelling data source in itself is the Internet. The amount of true business intelligence we can extract from the “open internet” – in everything from government filings, mainstream news, blogs, twitter, etc. is staggering. And don’t think about this as navigating our way to the right article (i.e. glorified Google News) but real analysis – find patterns, trends, clusters, outliers, anomalies, etc. ... "
In Fast Company Epicenter: Mobile is the next big thing? Wasn't it already? Well, yes, but it is getting much bigger and even more valuable if you just do the right few things. Just a few issues along the way to watch out for. BuzzData writes about what makes an Open Data Hub. " ... Which open data communities are thriving?Which ones are flailing or stalled? What are reliable indicators of either state? ... ". The recently published a map of Open Data Hubs Worldwide. Good, relatively technical overview of the concept with useful examples. In New Scientist: a new method claims to be able to track someone on the Internet within 690 meters. Note this has nothing to do with GPS on a mobile device, but probes the infrastructure of the net to approximate a location of say a laptop. Also a good discussion of current accuracies of location capabilities. Have followed these capabilities for some time for retail applications. The privacy implications are interesting here. Does it keep me from cloaking my location within the accuracy of the probe? In the innovation centers we were continually constructing experiments. Multiple options that would ultimately examine the space occupied by a new product, technology or process. Once tested in a laboratory setting, the focused experiment could be shipped to the real world. It is easy to design these experiments, but not as easy to efficiently and accurately perform them. Either in a virtual setting, a partially realistic lab, or in a real retail store. I was struck by a post in Google Research that overlapped some of our needs for multiple innovative experiments. With a pointer to a technical paper. This roll out fromYouTube can provide some useful training and information delivery opportunities. " ... The goal is to provide thousands of partners with the capability to live stream from their channels in the months ahead. In order to ensure a great live stream viewing experience, we'll roll this offering out incrementally over time.' ... "
A friend sends me this WSJ article on the Sleepless Elite. As a night owl myself I find this intriguing, can we make more use of our time this way, or is it less than health? " ...For a small group of people—perhaps just 1% to 3% of the population—sleep is a waste of time. Natural "short sleepers," as they're officially known, are night owls and early birds simultaneously. They typically turn in well after midnight, then get up just a few hours later and barrel through the day without needing to take naps or load up on caffeine.... "
Another example of a sensor connected to a smartphone. Here a multiple signal Oscilloscope. A device which was an early introduction of mine to electronics. Used to observe the wave shape of electronic signals, it was an early example of data visualization, well before computers were common. Forms of the device existed as early as 1899, and cathode ray tubes were connected in the 1920s. Another step forward. Data Struts It's Stuff in the NY Times. Nice article, the content of which many of us know already, yet it is good to see in a more popular space. I agree to the following, which states the goal well: "... They are computer scientists, statisticians, graphic designers, producers and cartographers who map entire oceans of data and turn them into innovative visual displays, like rich graphs and charts, that help both companies and consumers cut through the clutter. These gurus of visual analytics are making interactive data synonymous with attractive data... ". Yes, attractive, as long as it is also correct and not just spin. Have seen that too. In the latest issue of IEEE Intelligent Systems: Automatically analyzing Facial-Feature Movement to Identify Human Errors, by Maria Jabon, Sun Jao Ahn and Jeremy Bailenson of Stanford University. Using facial feature points automatically extracted from short video segments researchers couple computer vision with machine learning to predict performance over an entire task and at any given instant within the task. We spent some time look at the ability to look at shoppers while they were interacting with product on shelf to see their interest and likelihood of buying, The full article is not free online at this time. In Fastcompany: Quick thoughts on the art of listening online. Makes sense. I see that my old colleague Andre Martin now delivers his novel supply chain analysis system from the company Redprairie. You can find out much more about that here. Was very impressed by its simplicity and usefulness for difficult supply management. " ... A completely integrated retail supply chain is now possible – with the potential to provide substantial bottom-line benefits for both manufacturers and retailers. Changes at the stores can be instantly visible to the manufacturer's plants, and everyone in the extended supply chain can be working from a single set of demand forecast numbers .... ". See also his book: Flowcasting the Retail Supply Chain. Mark Montgomery of KYield writes in the Enterprise CIO Forum: Data Integrity: The Cornerstone for BI in the Decision Process When studying methods of decision making in organizations, mature professionals with an objective posture often walk away wondering how individuals, organizations, and even our species have survived this long. When studying large systemic crises, it can truly be a game changer in the sport of life, providing motivation that extends well beyond immediate personal gratification ... "
He goes on to enumerate a dirty dozen fault lines to look for in structural integrity of data ... "
Engadget outlines the test of an NFC phone payment system in Salt Lake in 2012. Another step towards phone-as-wallet. The big rollers are now involved. " ... Isis, a collaborative venture between AT&T, T-Mobile, Verizon and a bunch of banking big timers, has today announced the first market for its rollout of a contactless payment scheme ... "
Have started reading in the Chief Learning Officer (CLO) Blog. The post How do you lead the learning function is a good start. Largely agree, as long as it is understood that learning comes from all parts of the organization and needs to be structurally accessible to support many different kinds of decisions. We are very close to making that broadly possible today. Intriguing points about the relationship of social media to mass media. " ... Study Shows How Social Media Amplifies Mass Media ... Social media is touted by many as a way to get around the gatekeepers of media, the traditional old order of mass media setting the agenda for society has been tipped onto its head. ... Not really ... "
Is there a Digital Right to be Forgotten? Recently mentioned the issue of the long term ownership of data. Was directed to this Fast Company article about varying laws that touched on this, notably the difference between laws in the US versus EU Now we are seeing the further scrutiny of how Apps are gathering, storing and leveraging data. This could have a profound effect on how data is handled. In Forrester: Mobile payments enter a disruptive phase. A Rapidly changing area with acquisitions and big players working the space. " ... A recent article in The Wall Street Journal mentioned that Google could team up with MasterCard and Citigroup to pursue a role in mobile payments; this is yet another indication that disruption is looming in the payment space. ... " . Good overview of changes in this space. Via Bob McCarthy. Newly introduced to: Newfound Technologies, known for their work in Interactive Voice Response. (IVR) application development. Providing knowledge remotely is important in a number of industries. As most of us know, this is not often done well. Just brought to my attention the Billion Prices Project at MIT, designed to track and analyze inflation rates worldwide. The Department of Operations & Business Analytics at the University of Cincinnati’s College of Business is pleased to announce its Seventh Annual Workshop on Hot Topics in Supply Chain Analytics, Practice and Technology. This year’s workshop is entitled, “The Retailer: Supply Chain’s Last Mile.” There continues to be significant challenges and opportunities in managing today’s retail supply chains. This year’s workshop will focus on the interactions between the retailer and upstream members of the supply chain. Retailers are drowning in data but are having a difficult time developing actionable insights. The event will be held May 6, 2011, 10AM - 3:30PM at the University of Cincinnati’s Carl H. Lindner Hall in Cincinnati, OH. Seats are limited and registration is required. There is no registration fee. Pre-registrants, as of April 29, 2011, will receive the 2010 book “The New Science of Retailing: How Analytics are Transforming the Supply Chain and Improving Performance” by Marshall Fisher and Ananth Raman. A short descriptive piece by Roger Dooley on FMG (Facial Myography) for neuromarketing applications. Good piece in SASCom on Becoming a customer centric company - the new imperative. Excellent blog in general, give it a follow. In E-Commerce Times: Excellent post on the opportunities that exist in our always connected times with mobile commerce. Notably for my interests: " ... In-Store Shopping Applications: Mobile devices can become "virtual salespeople" by providing applications that enable customers to check product availability (both in-store and online), compare prices with other outlets and access reliable product information. (Enabling price comparisons with other outlets seems counterintuitive, but it actually is beneficial because it helps keep the customer in the store to negotiate pricing rather than having them leave to investigate pricing elsewhere.) ... "
iRobot, maker of the home task Roomba robot, gets considerable buzz in a Washington Post article. Their military, police and emergency robots seem to have value for nuclear emergencies. Meanwhile the Japanese have been working on and funding impressive, but less practical autonomous and humanoid robots. It makes for an interesting lesson. Fit the technology to clear, currently important and solvable tasks rather than trying to fit them with human intelligence and even charm. That is until you know you can. Fooling the eye may not solve the physical problem. Update: There is no clear evidence yet that Japan has used the iRobot devices. Please let me know if you have a link that says otherwise. In Engadget: A reminder that this has been going on for some while. It also reminds me that not shortly after this date I was starting to lift these 'portables' into the overhead bins of aircraft. A number of major brands, including Kroger, had their data breached. The article describes the extent of the break, but also the implications regarding the types of customer data involved. More care and scrutiny needs to taken when entrusting your data to other parties. A Focus Infographic on measures of data that is worth a look. Have been involved in a major supply chain analysis lately. It was an area I worked in early in my career. This Economist article discusses the effect of the Japanese disaster on how production capabilities and inventory safety decisions may need to be adapted in the future. Also reminds me of our reaction to Katrina, which I thought was exemplary, but also changed our view of the dynamics of the supply chain. In Roughtype: As a foodie much interested in how we interact with information about food and recipes online I found this quite interesting. How recipes are searched for and found in Google. Apparently this was recently changed, and despite all the recipe searching I do, I did not notice. What are the implications? It also ultimately deals with the semantic structure of a particular kind of knowledge that can be applied in other useful ways. In Technology Review: About Google's +1, searching and social networks. Letting your friends help prioritize search results. Like the old idea of letting friends help you choose your clothes. Not sure how successful that was, I would rather have an expert help me with that. The article makes the point that Google has relatively small amounts of social networking data to draw on. Or do they? The Number Guy blogs about statistical significance. A frequently asked question: Is it significant? And it turns out often a troublesome concept. Don't let the professionals fool you, but it is not as easy as what was taught in stat class. If often hinges on, surprise, the context of the decision problem you are attempting to formulate. The Marketing Science Institute has created a web site that celebrates its 50th anniversary. Some interesting links and features. Finding spam using fuzzy hashing and other uses. " ... 'Fuzzy hashing' was invented to flag spam emails, but has found application in everything from malware detection to genome sequence alignment .... "
" .... SimpleGeo's hosted spatial database service Storage was released from private beta. This is the flagship product from the company we named as most promising company of 2011. Storage is a hosted version of Apache Cassandra that has been modified to suit the needs of geolocation developers. The goal is to make it as easy as possible for developers to add geolocation features to Web and mobile applications ... "